• Amateur tattoos- Beware of amateur tattoos as they are made by jabbing ink or ashes or charcoal using a pin and can trigger an infection. • Cultural tattoos- Applied via traditional methods to members of the certain ethnic group to serve ritual or social functions. • Professional tattoos- Done by a professional tattoo artist using a tattoo gun. • Cosmetic tattoos- Used as a permanent makeup like eye liner or lip liner or hair imitations. It is repeatedly done to keep colors fresh. • Medical tattoos- Patients with medical conditions like diabetes have these tattoos to alert health care professionals during emergencies and yet to become popular in India. Why get a tattoo done? To stand out and show you are unique or to demonstrate your individuality or a few people also derive pleasure from pain while getting a tattoo done. If you are getting a tattoo done, make sure you go to a professional artist and the studio is as clean as a Doctor's clinic. Tattooing breaks your skin and the gun comes in contact with your blood and body fluids. So take care. 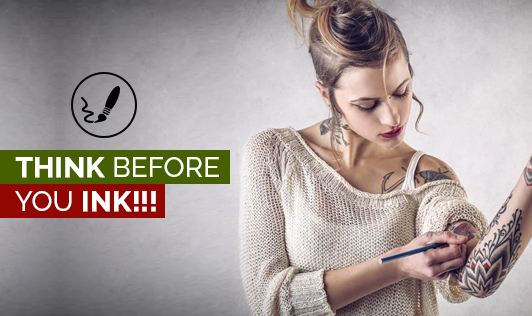 • Stay away from alcohol and drugs (aspirin) the night before or while getting a tattoo. • A big NO to tattoo if you are sick. • Make sure the needle in the tattoo gun is sterilized and unused. Cutting away the tattooed skin or rubbing away the tattooed skin with an abrasive device or laser treatments are a few methods for removing tattoos. A black tattoo can be removed completely when compared to a colored tattoo. However, there are many risks involved in removing a tattoo like allergic reactions or scarring of the skin. Any given day, tattoos are not recommended by the Health Experts as they come with many complications.